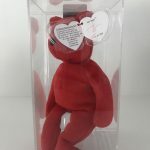 An authenticated Ty Beanie Baby #1 Bear sold for $5,600 on Ebay on April 27, 2017. The Beanie was an oddity because it was missing its emblem. The auction attracted 27 pids. The Beanie had been authenticated by Becky’s True Blue Beans and was rated “MWMT MQ! Absolutely Magnificent Beanie! Extremely Rare & Unique!” The heart tag was numbered 159/263 and was signed by Ty Warner. This oddity nearly quadrupled the value of the Beanie Baby. The #1 Bear was issued on December 12, 1998 to Ty Sales Reps and is considered one of the most valuable Beanie Baby of all times!